It performs motor run/stop along with direction functions. Speed selection via rotary switch (20 fixed speeds). Variable speed can also be controlled by an external analogue voltage (0 to 10V). Overload protection through a built-in thermister and current limiter; error signal in case of motor overload, Switchable PNP or NPN inputs / outputs. Acceleration and deceleration regulated using 2 potentiometers (0 to 2.5 sec). Automatic or manual restart after overload activation. 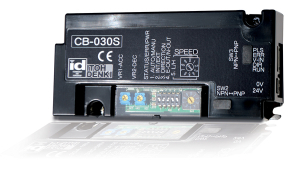 The CB-030 can deliver a PWM (Pulse Width Modulation) by means of a magnetic pulse.